There’s a subtle shimmer to this styrofoam snowman that adds to his appeal. You can make this project in a size suitable for tabletop decorating, or put together a smaller version for hanging on the tree. Piece the larger styrofoam ball with the wooden skewer. Carefully push the skewer all the way through the center of the ball, then all the way through the center of the medium-sized ball. Pierce the last ball with the skewer, but this time do not push the skewer all the way through; stop about halfway, then remove the ball. Apply white glue to the exposed part of the skewer, then push it into the top ball again. Use scissors to cut off any excess skewer at the bottom. 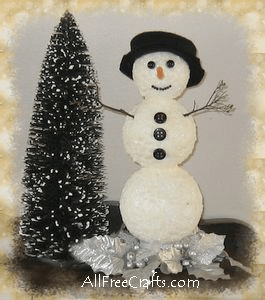 To make a base for a tabletop snowman, glue the bottom of the three stacked styrofoam balls to a round wooden disk and let dry. If desired, paint the wooden disk white. Apply snow tex paint, beginning at the top and working downwards, gently dabbing paint on with a small flat paint brush. Once you have one coat of snow paint completed, fill in any bare spots with additional dabs of paint. Let paint dry. To make the snowman’s hat, cut a 3″ circle from black felt. Now cut a 2″ circle from the center of the first one, leaving a 1/2″ brim all around. Cut a long felt strip, approximately 1/2 inch by 8 inches for the hat body. Apply a bead of white glue around the inner circle of the hat brim (not on top, but around the inner edge of the circle, as shown in the diagram, at right). Begin pressing one edge of the long felt strip into place against this line of glue, so that it stands up within the inner circle, to create the body of the hat. If the felt strip overlaps, trim to fit and apply glue down the seam to secure. To finish the hat, apply glue all around the edge of the remaining circle and gently fit it just inside the felt strip to make the top. Place the hat on the snowman’s head; if desired, glue in place. NOTE: This hat fits loosely on a 2″ ball, allowing the hat to be placed on an angle so that it covers most of the ball at the back. You can make a smaller hat to fit higher, or to fit a smaller ball. Just use the same construction method, but scale down the measurements to suit. Glue three black shirt buttons in a vertical row on the middle ball. Use the hack saw to cut off the large end of a golf tee for the snowman’s nose. Poke the sharp end of the golf tee into the middle of the snowman’s face, to make a hole for the nose, then remove it. Paint the golf tee orange and let the paint dry. Apply a little glue to the flat end of the painted golf tee and insert it into the hole that you just made. With your fingers press a shiny black bead into the styrofoam to make a shallow indent just above and to the right of the carrot nose. Repeat with the second black bead to make the left eye. Apply glue to the indented eye areas and insert the beads. Let the glue dry. Now it’s time to give the snowman a smile. Squeeze a small drop of glue onto a piece of paper. Pick up a seed bead with tweezers, dip it into the glue, then press it into place on the face. Repeat with as many seed beads as you wish to make the snowman smile. Finally, cut two twigs down to size for the arms. Insert each twig at shoulder height on the middle ball. Remove the twigs, apply a bit of glue to the end of each one, then re-insert into the arm holes. » Cut a length of ribbon or felt to make a scarf. Tie the scarf around the snowman’s neck. » Sit the tabletop snowman inside a decorative candle ring of artificial holly, evergreens, tinsel, or silver leaves.